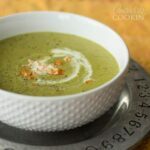 This cream of asparagus soup turned out to be the perfect way for me to use the stalks I was tossing out all the time. I eat asparagus fairly regularly with my eggs in the morning, but I don’t eat the full stalk as they tend to be tougher at the ends. 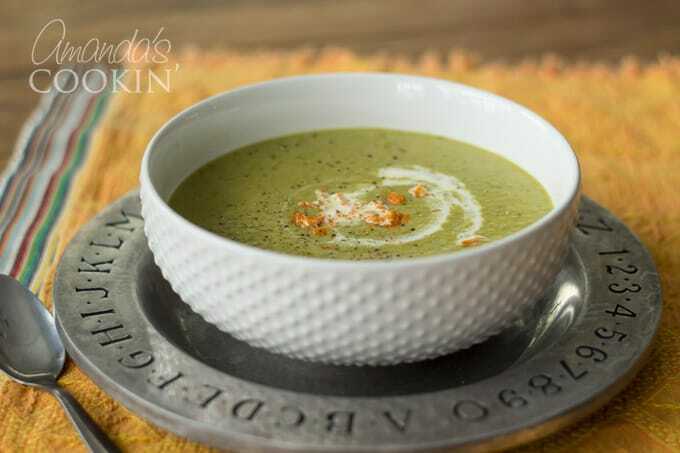 So I found this cream of asparagus soup and fell in love! This is an amazing way to use the ends you cut off before making your roasted asparagus! 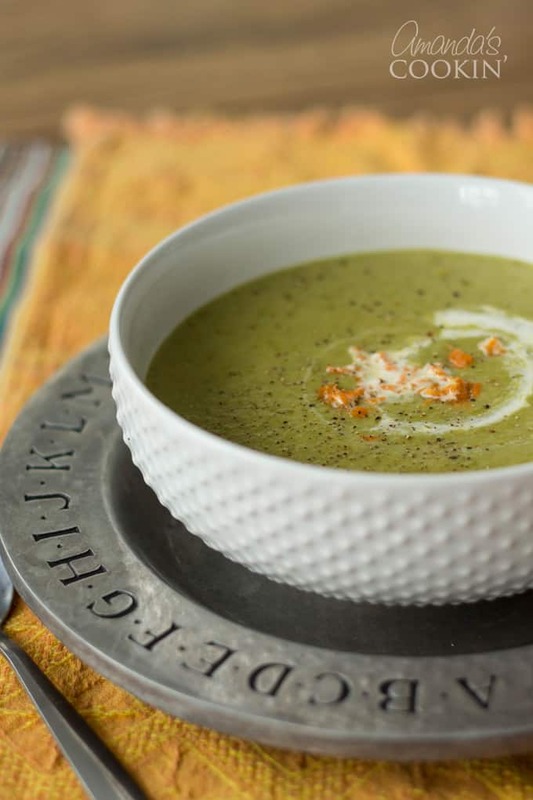 I’m definitely an asparagus lover, so this creamed soup was a gem of a find. I’ve made it twice now and love eating it for lunch. I’m freezing today’s batch into individual portions to enjoy later, and it can also be kept in the fridge for about a week. The first time I made this cream of asparagus soup I only used my immersion blender. It worked fine, but I did notice that there were still some “stringy” fibrous pieces in the soup. This time I used the food processor after cooking the asparagus and onion, then after adding the milk I ran the immersion blender through the soup for good measure. You can get the full instructions in the printer friendly version below, but here’s the run down. Cut up the asparagus spears and chop the onion. Combine those with 1/2 cup of the chicken broth. Cook it in a soup pot, bringing it to a boil over medium-high heat. Then turn it down to medium, put the lid on and cook it for ten minutes. Stir it now and again to make sure it’s not sticking to the pan. Run that through the food processor until all the pieces are broken up and the mixture is fairly homogenous. In the same pot you were using, melt two tablespoons of butter. Add the flour, salt and pepper to the melted butter and stir. You are making a roux, so cook it just for a minute until it smells like pie dough. Next, add the remaining chicken broth and stir until lumps disappear. Add the processed asparagus mixture to the roux, then add the milk. Bring everything to a boil, then reduce to a simmer. Run your immersion blender through the soup to make sure it’s nice and smooth. Looking for more soup ideas this winter? This easy white bean soup is full of protein without the meat. 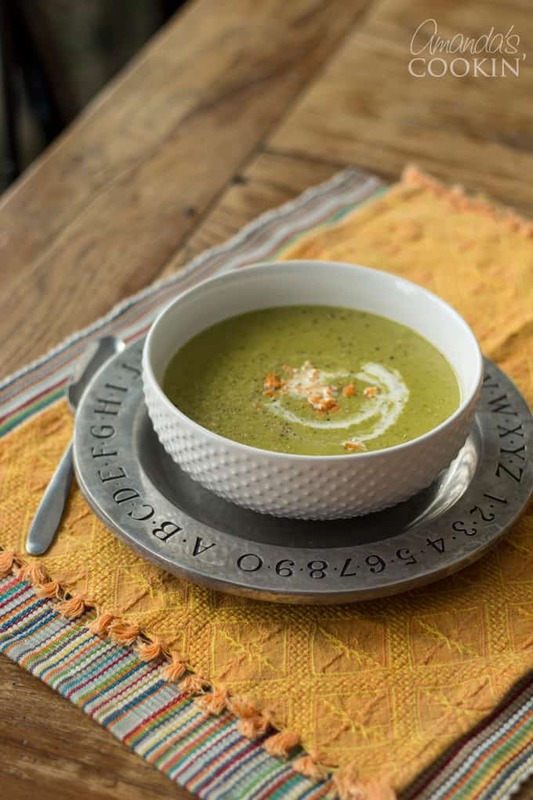 Split Pea Soup is a classic, hearty, and delicious option for a cold night in. On of our favorites this year is this Italian sausage tomato orzo soup, definitely a crowd pleaser! And a favorite year after year is this creamy white cheddar corn soup, so delicious! If you love asparagus, stop tossing out those ends because they make for a delicious, warming soup! Combine asparagus spears, chopped onion and 1/2 cup of the chicken broth in a soup pot. Bring to a boil over medium-high heat. Turn heat down to medium and cover, continue cooking for ten minutes. Stir it now and again to make sure it's not sticking to the pan. Pour asparagus mixture into food processor and process until all the pieces are broken up and the mixture is fairly homogenous. In the same soup pot you were using, melt two tablespoons of butter over medium heat. Add the flour, salt and pepper to the melted butter and stir. You are making a roux, so cook it just for a minute until it smells like pie dough. Add the remaining chicken broth and stir until lumps disappear. Add the processed asparagus mixture to the roux. Bring everything to a boil, then reduce to a simmer for 10 minutes. Run your immersion blender through the soup to make sure it's nice and smooth. I added a 1/8 tsp of mace to the soup and it was delicious. Absolutely delicious. Will be making again. Had to use half asparagus and half broccoli, still delicious. I skipped the blanching of the asparagus tips- just boiled everything. The lemon makes it SO DELICIOUS! Parm too. Simple and splendid; even my 2.5 year old loved it :) winner winner! 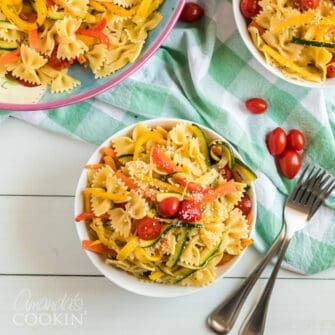 This looks absolutely delicious! I love asparagus, but I would’ve never thought to make soup out of it. Can’t wait to make this! 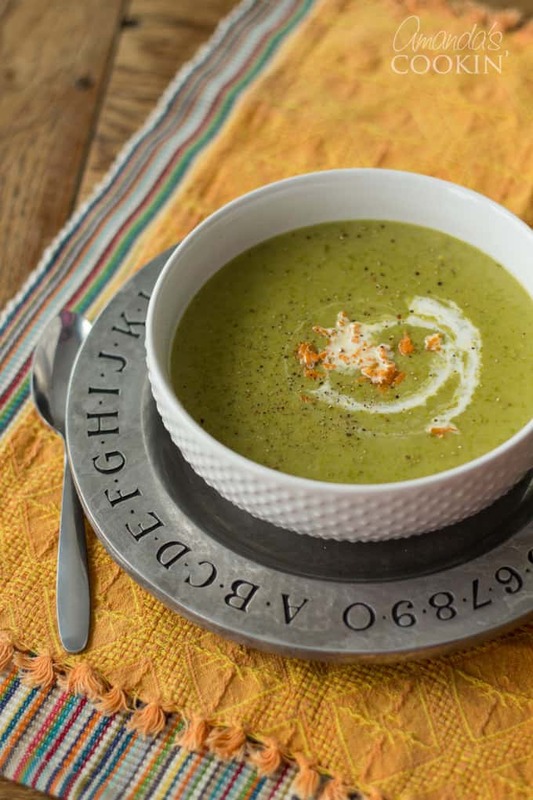 If you love asparagus like I do, you will love this soup!